Recovery Toolbox is out with a Brand-New DBX Recovery Solution Offering Unprecedented Efficiency. Recovery Toolbox, one of the most respected suppliers of data recovery tools for mainstream applications and an internationally recognized expert in the field of data recovery, announces the release of the all-new Recovery Toolbox for Outlook Express that has undergone a complete overhaul and now features a new data recovery engine. The program offers better performance, recovery accuracy and the same intuitive UI that made its predecessors so popular. 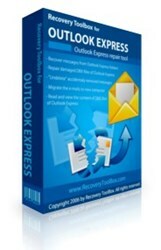 that the latest version of Recovery Toolbox for Outlook Express, a powerful DBX recovery tool.